The United Liberation Movement for West Papua (ULMWP) leaders Benny Wenda and Octovianus Mote are at the United Nations in Geneva for the 34th Session of the Human Rights Council – 1st March 2017, Geneva, Switzerland. Geneva – On 1st March 2017, the Vanuatu Minister of Justice, Ronald K Warsal, addressed the Council on behalf of seven Pacific nations. 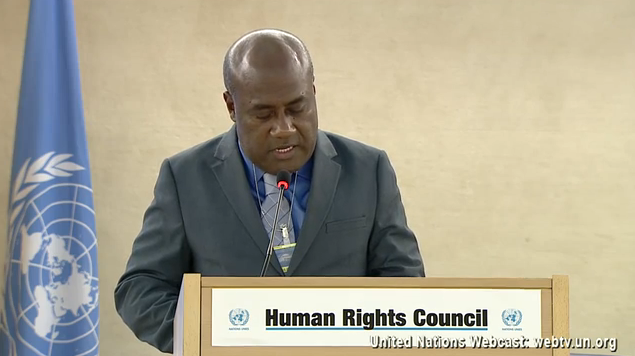 Vanuatu Minister of Justice, Ronald K Warsal, addresses the UN Human Rights Council on behalf of seven Pacific nations. Click image to watch the full address. Noting the failure of the Indonesian government to curtail these and other abuses, he called on the UN Human Rights Council to “request the High Commissioner for Human Rights to produce a consolidated report on the actual situation in West Papua”. He stated the report should “detail the various rights under the International Bill of Human Rights and the related conventions, including the right to self-determination,” something the West Papuan people have been striving for since 1963. In the next stage of the campaign, six young swimmers will embark on a 69 km journey up the length of Lake Geneva in August. They will carry with them a petition (which was launched in Westminster by Lord Harries of Pentregarth, Andrew Smith MP & Human rights activist Peter Tatchell) demanding an internationally supervised vote for the people of West Papua. So far 20,000 people have signed the petition on the Avaaz website, and reports of Avaaz being banned in Indonesia are currently being investigated. Find the Avaaz petition here. (Please sign & Share). You can follow the #BacktheSwim campaign here. We would like to thank the members of the Pacific Coalition for their continued support for the rights of the people of West Papua, including their right to self-determination. Support has come in from around West Papua to thank the leaders of the Pacific Coalition for their continued support. 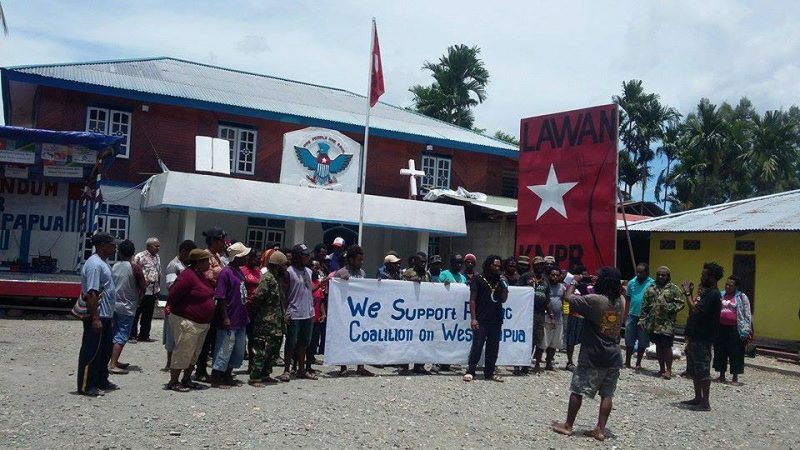 Support from the offices of KNPB, Port Numbay, Jayapura, West Papua.